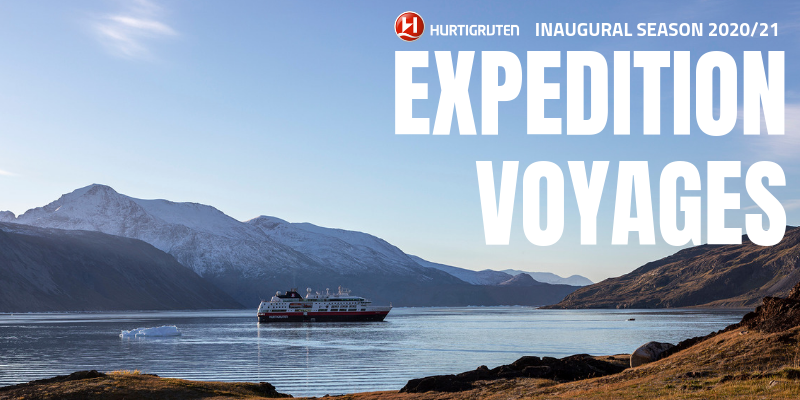 Are you ready to explore the world with Hurtigruten? On behalf of Hurtigruten, we have some huge news to share, new itineraries, new ships and a complete overhaul refurbishment of MS Fram. Offering more than 250 spectacular worldwide destinations, Hurtigruten’s 2020/21 expedition programme is really exciting! The inaugural season of the groundbreaking hybrid powered and eco-friendly MS Fridtjof Nansen – exploring the unspoiled and raw beauty of Antarctica, Greenland, Iceland and of course the Norwegian coast. There will also be the widest ever selection of Antarctica voyages – with more than 30 different itineraries to choose your perfect adventure to the white continent. Hurtigruten sail in some of the most pristine environments in the world, and are committed to preserving them. Their Norwegian love of the outdoors motivates them to work hard to enhance their destinations, strengthen environmental initiatives, and run a responsible and sustainable operation. Hurtigruten have sailed polar waters since 1893 and have more Arctic and Antarctic experience than anyone. The captains are superbly skilled navigators in any weather, including the most extreme conditions. This allows you to explore deeper and bring yourself closer to the most remote places on our planet. Hurtigruten’s fleet features the world’s first hybrid-powered expedition ships: MS Roald Amundsen and MS Fridtjof Nansen. These state of the art sister ships, named after great polar heroes, will revolutionise how we explore, offering you premium quality adventure travel experiences.